Custom t-shirts for less in Saint Louis by Kirkwood Trading Company is due to experience, quality, and efficiency with which we produce awesome logo tees. Now we don’t give them away and we don’t have subjective pricing that we lower at will which is why we don’t do many government contracts. We value our customers and we value the product we sell to them. 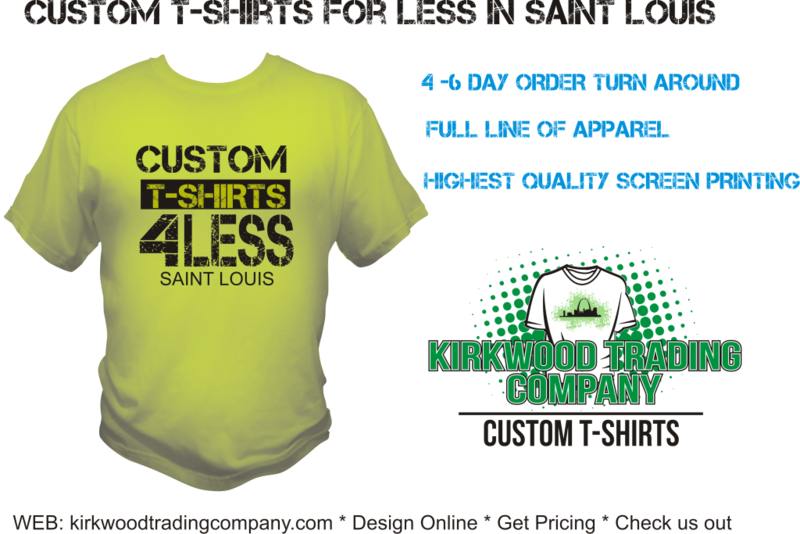 Kirkwood Trading Company has been printing custom t-shirts in Saint Louis for over 20 years and in that time we have learned some valuable lessens. 1. Give your customers a great product at a fair price and a relationship blossoms. 2. The customer really isn’t always right but when they are wrong, working out a beneficial solution is really all it takes for both parties to feel like they have been treated fairly. 3. Honestly and great customer service go a very long way. 4. Provide the customer with a product that is at least, or better than they expected and you have your best advertiser. 5. Simply treating our customers as we like to be treated when we are someone else’s customer is really what it’s all about. We are printing custom t-shirts, not brain surgery and while some people order t-shirts every month and think nothing of it, other people order shirts for the first time and it’s the most important thing in the world to them at that time. We get it, and we feel like what we do is really awesome and we try to project that excitement with each customer interaction and business dealing. We offer a full line of apparel with a 4-6 business day turn around (typically sooner) and we don’t charge rush order fees to do it that quickly either. Our pricing is all in one so the price per shirt is the price you pay without any hidden fees. We run our business with the mindset that we want to retire one day in the distant future and our prices reflect that we aren’t trying to retire on one job, we want to retire on continuous orders year after year while building relationships with our clients. Or simply email us direct through our contact us page. See why we provide custom t-shirts for less in Saint Louis.